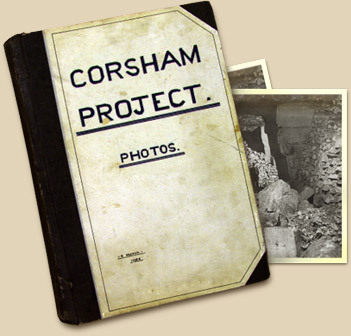 The advent of the Second World War signalled the most extensive phase of development within Corsham including Tunnel, Spring, Browns, Copenacre and Pickwick quarries. Operationally they functioned as separate entities but were dictated by the change in military threat with the Second World War. In the 1930s the War Office began investigating underground sites for storing ammunition, and attention was drawn to Tunnel Quarry. It was in many ways ideal with 44 acres of storage space directly connected to the GWR main branch line that entered a side tunnel at the east portal of Box Tunnel. Today, it retains a high level of survival including its 10 storage districts separated by concrete blast walls comprising 3-acres each, an underground railway and platform, conveyor belts for moving ammunition, huge ventilation fans, generators and barracks. At the west end of Tunnel Quarry was situated the south-west Signals Centre which survives less well, having continued in use for communications into the 21st Century. It began operation in 1943, and at this time it was one of three main signals centres in operation. In 1965 it ceased to be a station, coming under the umbrella of RAF Rudloe Manor and in this role saw a steady growth in its communications. Browns Quarry developed as a small independent quarry at the north-west of Tunnel Quarry; it came into operation in 1940 under No.10 RAF Fighter Group and was responsible for air defence of the western region. By 1950 Browns Quarry was selected to be the new Southern Sector Operations Centre, and the quarry continued in operation into the Cold War forming the HQ of the Controllerate of Defence Communications Network. Today, little remains of the Second World War use of the quarry as the Operations Room was gutted, and the remaining areas are empty shells. The advent of aerial warfare during the First World War brought with it the increasing demand for the mass production of fighters and bombers of standard design. By 1942, it was decided to locate the Bristol Aeroplane Company’s development works and the manufacturing of Centaurus engines below-ground at Spring Quarry, as well as the manufacture of undercarriages, gun barrels and turrets. The lifespan of the works was short-lived, and production ceased in 1945. Today, evidence of the works survives particularly the lifts and escalators used to transport the workers, and the large canteens containing striking murals by Olga Lehmann.